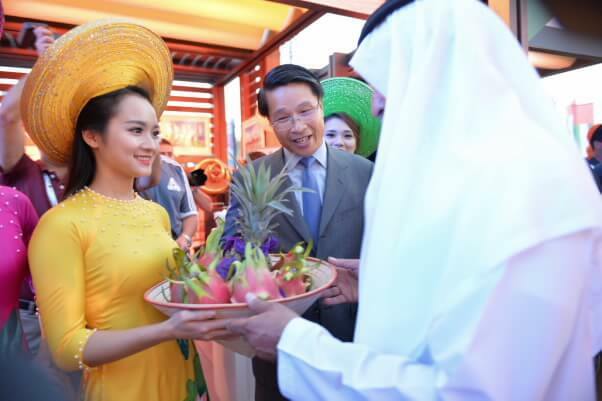 Evening February 12, 2015, the Embassy of Vietnam in the UAE organized Community Festival cozy and imbued with national identity Ất celebrate Spring Hare at the Embassy headquarters. 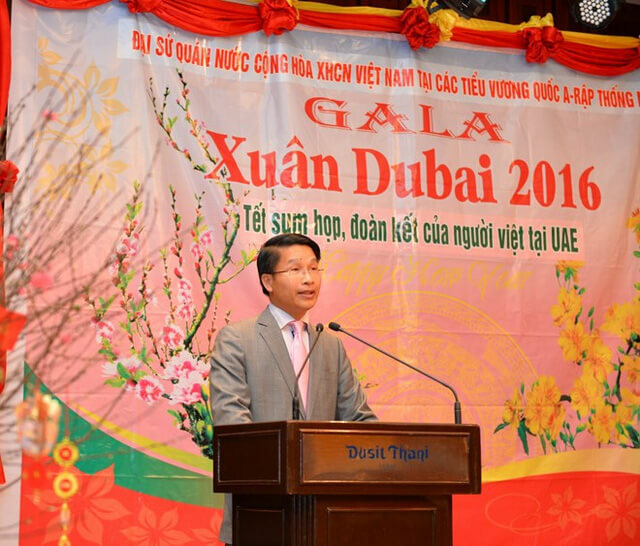 Attend Community Tet Vietnam Ambassador in UAE Pham Binh Dam and his wife, all officials, embassy staff, with nearly 300 overseas Vietnamese, labor represents more than 8,000 community Vietnam live, study and work in the UAE. 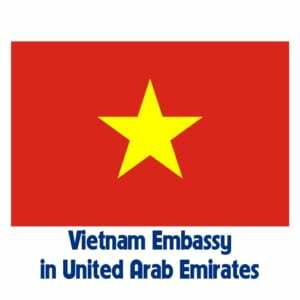 Speaking at a community meeting, Ambassador Pham Binh Dam confirmed Embassy will always be the home of Vietnamese people living, working and studying in the UAE, always supporting and protecting the legitimate rights of her children. Ambassador wishes sent to relatives on the occasion of the first health and hope the Vietnamese community in the block will stay in unity, unity of the homeland, to join hands in building the country prosperous Vietnam, simultaneously affirmed the consistent policy of the Party and State consider compatriots residing abroad are integral parts of the community of the people of Vietnam. Ambassador reviewed the highlights of bilateral relations Vietnam-UAE 2014, confirmed the commitment of the two governments to constantly nurture and develop good bilateral relations. Ambassador highly appreciated the contribution of the community in the UAE Vietnam for the development of the country as well as friendship bridge for relations between Vietnam and the UAE, particularly through the visit of Deputy Prime Minister Nguyen Xuan Phuc to UAE and Vietnam days event at the 2014 UAE recently. Tet community took place in a cozy atmosphere, petal solidarity. Community out of the exuberance, optimism on the threshold of a new spring, at the prospect of the country and bilateral relations, trust see, closer to the missions and engage more in the community.